This year’s Development and Climate (D&C) days were held at the periphery of the UNFCCC COP23 during its middle weekend. IFAD went beyond its traditional co-sponsoring role and partnered with ODI, MRFCJ, BSR, RCCC, CSAYN to organise a number of parallel sessions. At D&C Days the dynamic format encourages dialogue on a range of issues that link policy, knowledge and practice. Innovative approaches encourage participants to interact, challenge existing thinking and to generate new ideas. 1) Resilience through empowerment and access: exploring effective pathways to address poverty and climate vulnerability and manage climate risk, and to consider how engagement in decision making, equitable access to resources, and the provision of goods, services and innovation can be enhanced. 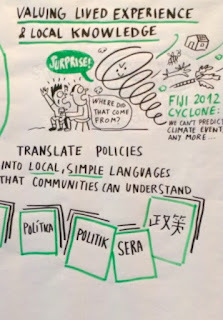 2) Valuing lived experience, and local knowledge: highlighting the importance of creating space and the voice of those at the development and climate frontline in all discussions related to climate and development. 3) Transparency and downward accountability: examining the ways in which decisions are made, climate responses are prioritised and climate finance is directed. 4) Shared resilience: recognising we live in an interconnected world with complex intercontinental supply chains, global financial flows, and decision making shared between the international, national and local levels, strategies for managing risk and building resilience must be designed and implemented together. IFAD contributed its experience and idea mainly to the first two themes. Over the course of the two days, IFAD spoke about gender responsive climate action and its contribution to community resilience. 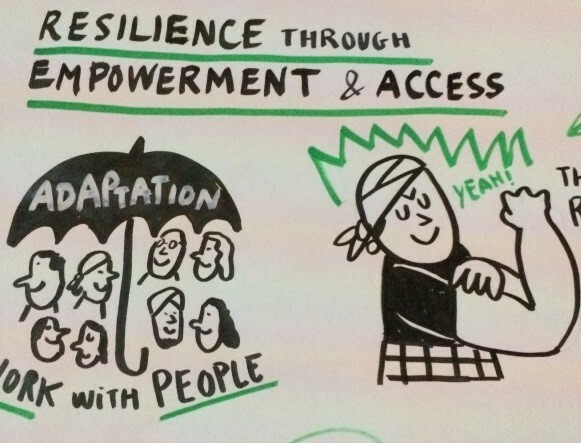 IFAD’s Ilaria Firmian brought into the ‘interactive learning circles’ (an approach where everyone will get to share their experiences and best practice) concrete experiences from the ASAP project in Mali. The high adoption rate of biogas technology in the project showed the importance of designing technologies that respond to women’s needs while at the same time benefitting also men. IFAD also gave its contribution into discussions related to mobilising private sector investments for climate resilience. Everyone felt that the private sector has never been so high in a COP agenda as it is this year. Public investment is clearly not enough - and this is even more true for the agriculture sector - leveraging private investment is a real need. 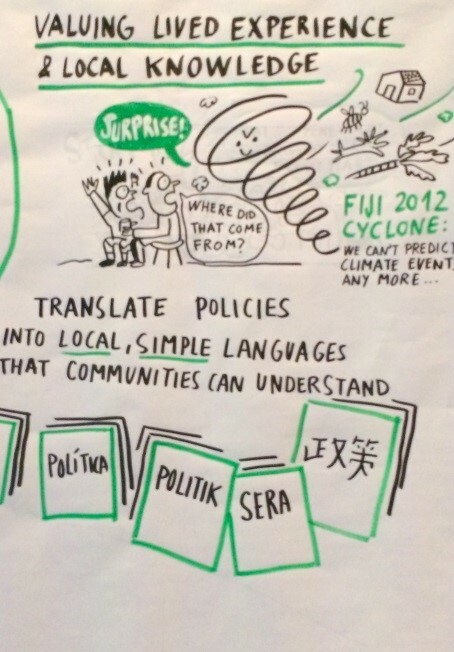 The importance of tapping into local knowledge and listening to local voices was another area to which IFAD brought relevant experience and a local partners’ perspective. “We have to be a part of a transparent inclusive discussion without blaming each other” has been repeated many times during this year’s D&C Days. Which is fully in line with the Fijian presidency pro-activity in bringing in all stakeholders, including business, local governments and grassroots representatives. At the end of the second day, there was a strong sense that by moving adaptation forward on the ground by providing guidance to implementation we could all provide inputs to the Talanoa Dialogue. The first step in that direction will be a short outcome document from D&C Days with high level messages to inform the dialogue.